For other species of date palms, see Phoenix (plant) § Species. 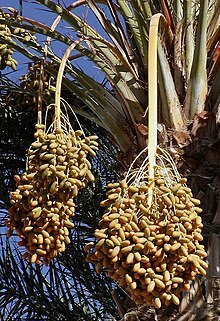 Phoenix dactylifera, commonly known as date or date palm, is a flowering plant species in the palm family, Arecaceae, cultivated for its edible sweet fruit. Although its exact place of origin is uncertain because of long cultivation, it probably originated from the Fertile Crescent region straddling between Egypt and Mesopotamia. The species is widely cultivated across Northern Africa, the Middle East, The Horn of Africa and South Asia, and is naturalized in many tropical and subtropical regions worldwide. P. dactylifera is the type species of genus Phoenix, which contains 12–19 species of wild date palms, and is the major source of commercial production. The species name dactylifera "date-bearing" comes from the Greek words daktylos (δάκτυλος), which means "date" (also "finger"), and fero (φέρω), which means "I bear". The fruit is known as a date. The fruit's English name (through Old French), as well as the Latin both come from the Greek word for "finger", dáktulos, because of the fruit's elongated shape. In Ancient Rome the palm fronds used in triumphal processions to symbolize victory were most likely those of Phoenix dactylifera. The date palm was a popular garden plant in Roman peristyle gardens, though it would not bear fruit in the more temperate climate of Italy. It is recognizable in frescoes from Pompeii and elsewhere in Italy, including a garden scene from the House of the Wedding of Alexander. A date palm cultivar, probably what used to be called Judean date palm, is renowned for its long-lived orthodox seed, which successfully sprouted after accidental storage for 2000 years. The upper survival time limit of properly stored seeds remains unknown. 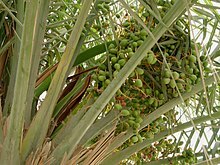 A genomic study from New York University Abu Dhabi Center for Genomics and Systems Biology showed that domesticated date palm varieties from North Africa, including well-known varieties such as Medjool and Deglet Noor, are a hybrid between Middle East date palms and the Cretan wild palm P. theophrasti. Date palms appear in the archaeological record in North Africa about 2,800 years ago, suggesting that the hybrid was spread by the Minoans or Phoenicians. Date fruits are oval-cylindrical, 3–7 cm (1.2–2.8 in) long, and 2–3 cm (0.79–1.18 in) diameter, and when ripe, range from bright red to bright yellow in colour, depending on variety. Dates contain a single stone about 2–2.5 cm (0.8–1.0 in) long and 6–8 mm (0.2–0.3 in) thick. Three main cultivar groups of date exist: soft (e.g. 'Barhee', 'Halawy', 'Khadrawy', 'Medjool'), semi-dry (e.g. 'Dayri', 'Deglet Noor', 'Zahdi'), and dry (e.g. 'Thoory'). The type of fruit depends on the glucose, fructose, and sucrose content. 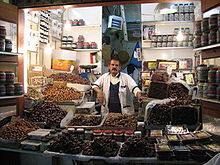 Dates are an important traditional crop in Iraq, Iran, Arabia, and north Africa west to Morocco. Dates (especially Medjool and Deglet Noor) are also cultivated in America in southern California, Arizona and southern Florida in the United States and in Sonora and Baja California in Mexico. Date palms can take 4 to 8 years after planting before they will bear fruit, and start producing viable yields for commercial harvest between 7 and 10 years. Mature date palms can produce 150–300 lb (70–140 kg) of dates per harvest season. They do not all ripen at the same time so several harvests are required. To obtain fruit of marketable quality, the bunches of dates must be thinned and bagged or covered before ripening so that the remaining fruits grow larger and are protected from weather and animals that also live off of it, such as birds. Date palms require well-drained deep sandy loam soils with pH 8-11. The soil should have the ability to hold the moisture. The soil should also be free from calcium carbonate. ʿAbid Rahim (Arabic: عبد رحيم‎) – from Sudan. In Nigeria it is called Dabino. Barakawi (Arabic: بركاوي‎) – from Sudan. Barhee or barhi (from Arabic barh, meaning 'a hot wind') – these are nearly spherical, light amber to dark brown when ripe; soft, with thick flesh and rich flavour. One of the few varieties that are good in the khalal stage when they are yellow (like a fresh grape, as opposed to dry, like a raisin). Bireir (Arabic: برير‎) – from Sudan. Deglet Noor Algerian cultivar originated from the zibane region in the north eastern Algerian desert (the oases of Tolga, Biskra) — so named because the centre appears light or golden when held up to the sun. This is a leading date in Libya, Algeria, the United States, and Tunisia. Khalasah (Arabic for quintessence) – one of the major palm cultivars in Saudi Arabia. Its fruit is called Khlas. Notably produced in Hofuf (Al-Ahsa) and Qatif in the Eastern Province of Saudi Arabia (ash-Sharqīyah). Medjool or (Majdool) (Arabic: مجدول‎) – from Morocco, also grown in the United States, Israel, Saudi Arabia, South Africa, Jordan, and United Arab Emirates; a large, sweet and succulent date. Mazafati or Mozafati – (Persian: مضافتی‎, "Suburban/Peripheral") It is a dark, fleshy and sweet date of medium size with a relatively high moisture content and is suited for fresh consumption, i.e. not dried. At a temperature of −5 degrees Celsius (23 °F) it can be kept for up to 2 years. It is grown in Iran, in particular in Kerman province, and often named "Bam date", after the city of Bam in that province. Piarom – A large, thin skin, black-brown semi-dry date - from Iran. Rotab (Arabic: رطب) – from Iraq, they are dark and soft. Sukkary – (Arabic: سكري, "Sugar" or "Sweet one") Yellow skinned; faintly resilient and extremely sweet, often referred to as ‘royal dates’. It's cultivated primarily in Al Qassim, Saudi Arabia. It's arguably the most expensive and premium variety. Sellaj – (Arabic: سلّج‎) in Saudi Arabia. Zaghloul (Arabic: زغلول‎) – Dark red skin, long, and very crunchy when fresh (when they are typically served); extremely sweet, with sugar content creating a sense of desiccation in the mouth when eaten. The variety is essentially exclusive to Egypt, where it is subject to an element of nationalist sentiment on account of sharing a name with national hero Saad Zaghloul. The Gaza Strip, especially Deir al-Balah ("Village of Dates"), is known for its exceptionally sweet red dates. A major palm pest, the red palm beetle (Rhynchophorus ferrugineus) currently poses a significant threat to date production in parts of the Middle East as well as to iconic landscape specimens throughout the Mediterranean world. In the 1920s, eleven healthy Madjool palms were transferred from Morocco to the United States where they were tended by members of the Chemehuevi tribe[which?] in a remote region of Nevada. Nine of these survived and in 1935, cultivars were transferred to the "U.S. Date Garden" in Indio, California. Eventually this stock was reintroduced to Africa and led to the U.S. production of dates in Yuma, Arizona and the Bard Valley in California. Dry or soft dates are eaten out-of-hand, or may be pitted and stuffed with fillings such as almonds, walnuts, pecans, candied orange and lemon peel, tahini, marzipan or cream cheese. 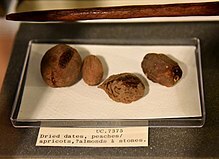 Pitted dates are also referred to as stoned dates. Partially dried pitted dates may be glazed with glucose syrup for use as a snack food. Dates can also be chopped and used in a range of sweet and savory dishes, from tajines (tagines) in Morocco to puddings, ka'ak (types of Arab cookies) and other dessert items. Date nut bread, a type of cake, is very popular in the United States, especially around holidays. Dates are also processed into cubes, paste called 'ajwa, spread, date syrup or "honey" called "dibs" or rub in Libya, powder (date sugar), vinegar or alcohol. Vinegar made from dates is a traditional product of the Middle East. Recent innovations include chocolate-covered dates and products such as sparkling date juice, used in some Islamic countries as a non-alcoholic version of champagne, for special occasions and religious times such as Ramadan. When Muslims break fast in the evening meal of Ramadan, it is traditional to eat a date first. Reflecting the maritime trading heritage of Britain, imported chopped dates are added to, or form the main basis of a variety of traditional dessert recipes including sticky toffee pudding, Christmas pudding and date and walnut loaf. They are particularly available to eat whole at Christmas time. Dates are one of the ingredients of HP Sauce, a popular British condiment. In Southeast Spain (where a large date plantation exists including UNESCO-protected Palmeral of Elche) dates (usually pitted with fried almond) are served wrapped in bacon and shallow fried. In Israel date syrup, termed silan, is used while cooking chicken and also for sweet and desserts, and as a honey substitute. Dates are one of the ingredients of jallab, a Middle-Eastern fruit syrup. Date seeds are soaked and ground up for animal feed. Their oil is suitable for use in soap and cosmetics. Date palm seeds contain 0.56–5.4% lauric acid. They can also be processed chemically as a source of oxalic acid. Date seeds are also ground and used in the manner of coffee beans, or as an additive to coffee. Experimental studies have shown that feeding mice with the aqueous extract of date pits exhibit anti-genotoxic and reduce DNA damage induced by N-nitroso-N-methylurea. 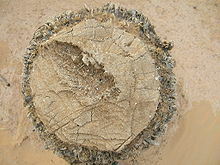 Apart from P. dactylifera, wild date palms such as Phoenix sylvestris and Phoenix reclinata, depending on the region, can be also tapped for sap. Young date leaves are cooked and eaten as a vegetable, as is the terminal bud or heart, though its removal kills the palm. The finely ground seeds are mixed with flour to make bread in times of scarcity. The flowers of the date palm are also edible. Traditionally the female flowers are the most available for sale and weigh 300–400 grams (11–14 oz). The flower buds are used in salad or ground with dried fish to make a condiment for bread. Dates are mentioned more than 50 times in the Bible and 20 times in the Qur'an. In Islamic culture, dates and yogurt or milk are traditionally the first foods consumed for Iftar after the sun has set during Ramadan. Phoenix dactylifera held great significance in early Judaism and subsequently in Christianity, in part because the tree was heavily cultivated as a food source in ancient Israel. In the Bible palm trees are referenced as symbols of prosperity and triumph. In Psalm 92:12 "The righteous shall flourish like the palm tree". Palm branches occurred as iconography in sculpture ornamenting the Second Jewish Temple in Jerusalem, on Jewish coins, and in the sculpture of synagogues. They are also used as ornamentation in the Feast of the Tabernacles. Palm branches were scattered before Jesus as he entered Jerusalem on Palm Sunday. Palmeral de Elche in Southern Spain. ^ The Plant List, Phoenix dactylifera L.
^ "Phoenix dactylifera". Germplasm Resources Information Network (GRIN). 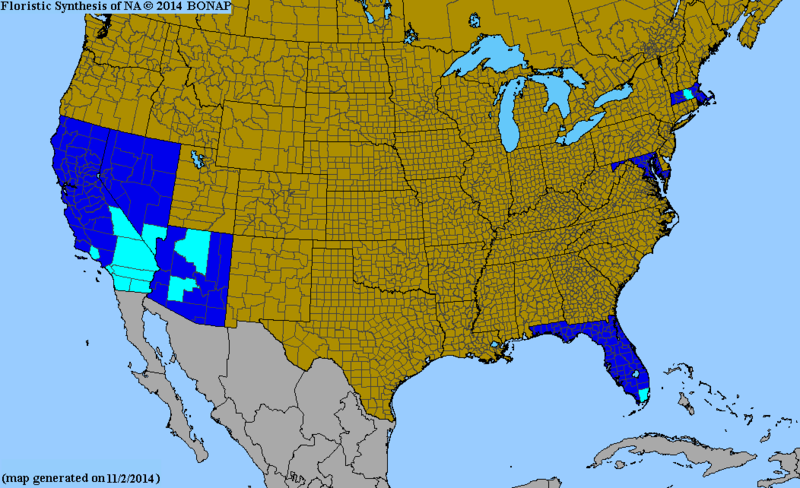 Agricultural Research Service (ARS), United States Department of Agriculture (USDA). Retrieved 10 December 2017. ^ a b Krueger, Robert R. "Date Palm Genetic Resource Conservation, Breeding, Genetics, And Genomics In California" (PDF). The Conference Exchange. Retrieved 2018-03-26. ^ a b Divya Bichu. "Arabian Desert Plants". Buzzle. Retrieved 19 April 2015. ^ a b "FAOSTAT:Crops". Elements:Production Quantity / Items:Dates / Years:2016. Retrieved 2018-03-26. ^ "Date Palm". 15 October 2008. HowStuffWorks.com. ^ a b "Medjool: A Date to Remember". NPR.org. 17 October 2007. Retrieved 19 April 2015. ^ Tengberg, M. (November 2012). "Beginnings and early history of date palm garden cultivation in the Middle East". Journal of Arid Environments. 86: 139–147. doi:10.1016/j.jaridenv.2011.11.022. ^ Kenoyer, Jonathan Mark; Heuston, Kimberley Burton (2005). The Ancient South Asian World. The World in Ancient Times. Oxford University Press. ISBN 978-0-19-522243-2. Retrieved 30 July 2013. ^ Ernest Small (2009). Top 100 Food Plants. p. 231. ^ Hanson, Wendy (2008-06-13). "Date palm seed from Masada is the oldest to germinate". Los Angeles Times. ^ Bonner, Franklin T. (April 2008). "Chapter 4 Storage of Seeds" (PDF). Woody Plant Seed Manual, USDA FS Agriculture Handbook 727. National Seed Laboratory, 5675 Riggins Mill Rd, Dry Branch, GA 31020. Retrieved 2008-06-21. ^ Flowers, Jonathan; et al. (2019). "Cross-species hybridization and the origin of North African date palms". Proceedings of the National Academy of Sciences USA. 116 (5): 1651–1658. doi:10.1073/pnas.1817453116. PMC 6358688. PMID 30642962. ^ "The Date, Phoenix dactylifera". Retrieved 19 April 2015. ^ "Date Palm - Phoenix dactylifera". www.growables.org. Retrieved 2019-04-06. ^ "Nakhil Dates - Iranian Dates Exporter". Archived from the original on 28 May 2015. Retrieved 19 April 2015. ^ "Date Fruits: Benefits, Palm, cultivation - Green Diamond Dates". ^ "Popular date palm fruit types: Sukkary dates". Fodakty. Retrieved 2018-10-19. ^ Allen, Lee (25 April 2014). "How One Indian Couple Saved 'The Fruit of Kings'". Indian Country News. Retrieved 2016-02-27. ^ Das, Bhagwan; Sarin, J. L. (1936). "Vinegar from Dates". Industrial & Engineering Chemistry. 28 (7): 814. doi:10.1021/ie50319a016. ^ Forbes, Robert James (1971). "Studies in Ancient Technology". ^ Walid Al-Shahib, Richard J. Marshall (2003). "The fruit of the date palm: its possible use as the best food for the future?". International Journal of Food Sciences and Nutrition. 54 (4): 247–259. doi:10.1080/09637480120091982. ^ Miller, CJ; Dunn, EV; Hashim, IB (2002). "Glycemic index of 3 varieties of dates". Saudi Medical Journal. 23 (5): 536–8. PMID 12070575. ^ Maier, VP; Metzler, DM; Huber, AF (1964). "3-O-Caffeoylshikimic acid (dactylifric acid) and its isomers, a new class of enzymic browning substrates". Biochemical and Biophysical Research Communications. 14 (2): 124–8. doi:10.1016/0006-291x(64)90241-4. PMID 5836492. ^ Diab, K.A; E. I. Aboul-Ela (2012). "In Vivo Comparative Studies on Antigenotoxicity of Date Palm (Phoenix Dactylifera L.) Pits Extract Against DNA Damage Induced by N-Nitroso-N-methylurea in Mice". Toxicology International. 19 (3): 279–286. doi:10.4103/0971-6580.103669. PMC 3532774. PMID 23293467. ^ Kiran, S (2014). "Floral Stalk on Date Palm: A New Discovery". Int J Agril Res Innov Tech. 4 (2): 53–54. doi:10.3329/ijarit.v4i2.22649. ^ a b James Hastings (1909). Dictionary of the Bible. p. 675.